In 2013, Chicago Public Schools (CPS) closed fifty public schools largely on the South and West Sides—the largest school closing in a single city in American history. Four months before, trying to head off the public backlash that quickly followed regardless, the district self-imposed a five-year moratorium on school closings. That moratorium lifted this year and in March, CPS consolidated four Englewood high schools into one and voted to close the level 1+-rated National Teachers Academy (NTA) elementary school to turn it into a neighborhood high school for the South Loop and Chinatown. 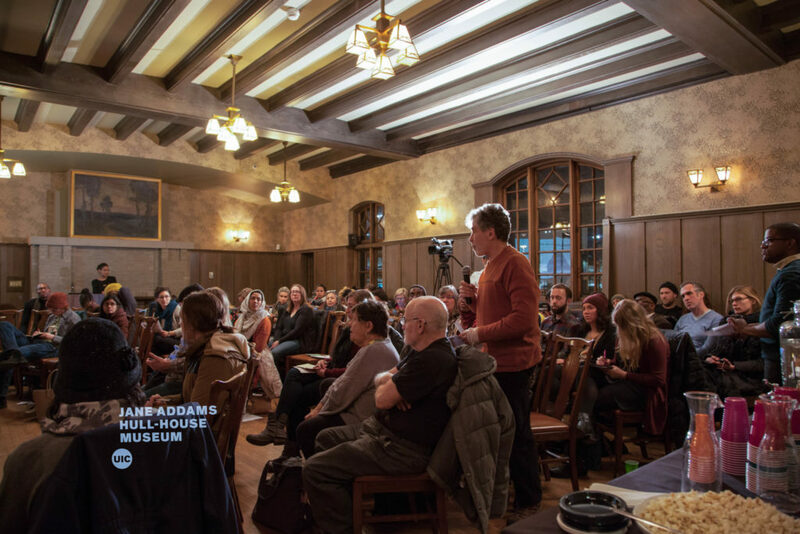 As these closures, mergers, and consolidations—and the activism around them—have heated up over the past four months, the Jane Addams Hull-House Museum at the University of Illinois at Chicago hosted three panel discussions as part of its project “Making the West Side: Community Conversations on Neighborhood Change,” of which the Weekly attended two. In the welcoming remarks for the second panel discussion, “West Side/South Side: Coalitioning Around School Closures,” museum director Jennifer Scott drew connections between the advocacy of Jane Addams and her colleagues on behalf of newly-arrived immigrants over one hundred years ago and the activism on behalf of families in CPS today. During both forums, each panelist provided a different perspective on a lack of process and transparency in school closings. Candace Moore, an attorney for Chicago Lawyers’ Committee for Civil Rights’ Education Equity Project, noted during the second panel that while it is true that many schools that were closed were under-enrolled, partly due to the shifting population of Chicago, “the conversation of how we got that way is never had.” One of the takeaways from the forum was that any focus on present-day issues that does not acknowledge actions taken in the past that contributed to those present-day issues will be incomplete. In the final forum in the series, “More Schools for Sale? CPS Before and After the Moratorium,” moderator Kalyn Belsha, who covers education for the Chicago Reporter and recently completed a yearlong series on the aftermath of the school closings, noted that Kansas City, which closed twenty-eight schools from 2009-2010, has been held up as a model for how a city should handle the repurposing of school buildings. However, CPS ignored this model, Belsha said. After the Chicago schools were closed, many buildings sat unused for so long that their physical conditions worsened, which in turn reduced their possibilities for being sold or repurposed. Today, ten schools are still empty and lack plans for repurposing. Gladson also noted that the challenges shouldered by schools that received the students from closed schools were significant. She said that students with special needs were particularly at risk: their records and Individualized Education Programs (IEPs), documents that lay out the special accommodations that students with special needs will receive at school, were often lost or not followed in the transition to a new school. Moreover, the instructions to receiving schools were all the same, even though “we know that schools have very different needs and serve very different populations,” she said. Members of the second panel also explored the relationship between CPS’s poor financial choices over the years and district decisions to close or merge schools. Byron Sigcho, executive director of the Pilsen Alliance, identified several problematic actions taken by the Board of Education in recent years: contracts given to friends and political supporters and toxic loan swaps led to higher-than-anticipated debt payments, both of which drained the coffers of CPS. With decreased financial resources for schools, many—especially those in low-income neighborhoods—have suffered. They are labeled as underperforming and as a result, end up under-enrolled, ultimately slated for closure. When asked by moderator Amara Enyia, a public policy consultant and 2015 mayoral candidate, if there was ever a situation in which closing a school is the right thing to do, South and West Side social worker Simone Woods said, “If, in fact, we do have a school that is under-utilized and underperforming in the actual context and there is no corruption that is involved in that [decision to close], then of course” it could make sense to close a school. “However,” she added, “there is a right way to do things.” The goal, she said, doesn’t leave children feeling as though they are somehow at fault. At the third forum, panel members identified one exemplary case of a CPS school change: the merger of Near North Side elementary schools Jenner Academy of the Arts and Ogden International School of Chicago, approved on February 28, 2018. Jenner, previously a nearly all-Black, under-enrolled elementary school served students from Cabrini-Green or other subsidized housing projects nearby. Ogden International was an overcrowded K-12 school that served a higher-income white population in Gold Coast. Members the two schools’ communities worked together for two years and underwent extensive transition planning with the help of outside consultants. Beginning in the fall, 2018, Jenner will be consolidated into Ogden and their attendance boundaries will be merged, with both buildings being utilized by the student body. Regardless of one-off successes, the lack of transparency from the district troubled panelists in both discussions. Ponce de León of Generation All mentioned that there were no public hearings held regarding CPS’s new online application for high schools, called GoCPS, and that when parents asked the district for more time to consider the system, CPS declined. In addition, CPS has refused to release the algorithm that GoCPS uses. CPS CEO Janice Jackson recently held some community meetings around the city, though Ponce de León noted that they were invitation only, not open to the community..
At the end of the third forum, Belsha asked the panelists for suggestions on how to help Chicagoans better understand the issues. Ponce de Leon suggested attending Local School Council meetings to get a better view of school-level concerns. She said that groups such as Raise Your Hand, Generation All, and the Brighton Park Neighborhood Council offer good sources of information, and Belsha acknowledged the many excellent education reporters in Chicago. Panelist and architect Paola Aguirre, whose Borderland Studios is working with the Hull-House Museum on a current exhibit, urged audience members to share the information they gain with others. A current exhibit in the museum, “Claiming Space: Creative Grounds and Freedom Summer School,” like the panel discussions, provided an inspiring bridge between past and current activism. One of the pieces of art made by the children at Sumner Math and Science Community Academy with West Side artists featured the bullet belt that Harriet Tubman is famously pictured with reimagined as a paper belt with crayons spray-painted silver. By taking courage from heroes in the past and acknowledging the challenges they overcame, activists are collaborating to find ways they can creatively tackle and overcome the challenges of the present. Katie Gruber is a contributor to the Weekly. She is from Cincinnati but has lived in Hyde Park since 1996. Her book “I’m Sorry for What I’ve Done”: The Language of Courtroom Apologies was published by Oxford University Press in 2014. Since then she has been active in issues surrounding public education. She last wrote for the Weekly about CPS’s school rating system in February. Dear Ms. Gruber Thank you so much for a wonderful informative article on Communities Respond to School Closing. I remember the first round of school 2014 of fifty schools. It hit my community in all directions my children were devasted. I still believe strongly mass school only brings anger confusion and disgust within the black community must done slowly providing open conversation research data and analyst in how we can help the community instead of destroying it. I am proud to say the first school closing was the worst day ever but the best become a community actvist working with STOP!